So we came and put that beautiful Queen Creek epoxy flooring, polyaspartic or concrete stain floor coating in your Arizona garage and when we left, we left you wondering how to keep your garage floors as beautiful as they are right now. You may be wondering if sweeping is enough, whether to use cleaner or just water to keep you freshly coated floors in pristine condition. To take the guesswork out of concrete floor care, we have compiled a small, but helpful How-To list. The Old Fashioned Dust Mop An oldie but goldie, with the purchase of a high quality dust mop, you have already satisfied about 85 % of your epoxy floor coating’s cleaning needs. To ensure that cleaning is more gain than pain, your mop should measure anywhere between 24 to 36 inches. You can purchase it anywhere from online stores such as amazon to your local hardware or home improvement store. Because one of the awesome benefits of your Queen Creek epoxy garage floor coating is that it readily releases dirt, mopping once or twice a week is a good way to ensure that your floors stay clean. A dust mop is also a great solution for your polyaspartic coated floors or for those which are concrete stained or your grind a seal processes floors. Anything that readily releases dirt does well with a dust mop. You can even use the mop if you have a non-slip coating. If your garage floors have grout lines, you can vacuum dirt out every so often, as the mop won’t be able to get in crevices or you can use the skinny side of a brook to get dirt and dust out. Of course, there will be times when the dust mop won’t do. For small spills or even leaks from your car, you can use a wet cloth and maybe some all purpose cleaner to clean it up right away and to ensure that it doesn’t leave a film behind. If your garage sees a lot of action, you may want to add some deep cleaning every 12 weeks or so. Your choices are the less expensive string mops, which do well in a pinch, but really don’t clean as well, plus they can make your floor look streaky. The better choice is one of those hard foam mops and a decent cleaning agent. Barefoot Surfaces’ experts swear by a mixture of water and all-purpose cleaner, or ammonia works well as well. Just give your floor a good scrubbing or two ( in areas showing more signs of wear) and let it air dry, or if you are really ambitious about making your floors shine, you can towel dry them with a clean towel as well. Maybe you come across a dried stain or some obscure sticky substance on your beautiful Arizona epoxy or polyaspartic coated floor, in which case you can use a bristle cleaning brush to scrub away the dirt. Don’t overscrub or you can compromise the surface of the epoxy coat. Tire marks will appear almost inevitably on your garage floors. If you perform regular garage floor maintenance for your Arizona garage floors, odds are, tire marks won’t stand a chance. If they do pop up, there are great product that are specifically created for tire marks. As with all stains, remove them as soon as you notice them. CLR can be a great solution to get rid of salt stains (kind of rare in Central AZ, but still I want to include this issue) and rust that may stem from old gardening tools etc. Don’t let it sit on the floor for too long to not compromise the integrity of the floor coating. Use your trusted scrubbing brush and brush away the stains. Rinse with clean water, let dry, enjoy. After these great tips on what to do, I want to briefly touch on what not to do to your Arizona garage floors. While natural cleaning products have increased drastically in popularity, we recommend to NOT use vinegar or citrus based cleaners. Why? Because the acid they contain can wear away the glossy finish of your coat, much like enamel wears away on your teeth when you drink acidic juices. They are fine to use once in awhile, when you just have to clean the floor, but should not be used on a regular basis. While it seems counterintuitive, we also want to caution against using cleaners with soap. Yes soap cleans well, but it also can leave unsightly streaks behind and not only that, when your floor gets wet-and your garage floor will get wet- it increases risk of injury because soapy floors are very slippery. If you follow these easy steps your professional concrete coating will look great and last you for years to come. 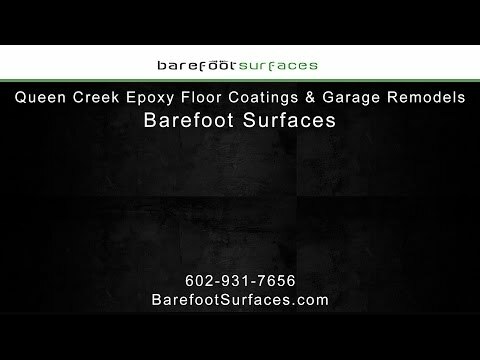 Barefoot Surfaces has installed countless floor coatingss indoors and outdoors in Arizona for many years, including patio epoxy flooring in Queen Creek. If you would like to know more about our East Mesa floor coating services, feel free to contact us today.